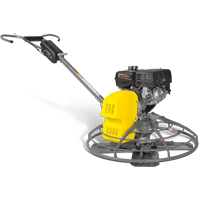 The models of the CT36 trowel range feature a trowel diameter of 36 inches – ideal for finishing medium sized areas. 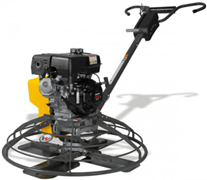 The trowels are optimally balanced, therefore they can be effortlessly controlled in the wide range of speeds. The transmission brake, electronic safety switch and engine speed sensor offer additional triple protection for the user. In an emergency situation the device will simply switch off and the handle will come to a stand-still after no more than a three-quarter turn. Furthermore, the unit will only start if the throttle lever is set to zero. This prevents an inadvertent rotation of the handle on start-up. Height adjustable handle with ProShift® System enables continuous adjustment of the floating blade pitch as well as individual height adjustment.